You may be suffering from fairy tale reinvention fatigue at the moment what with TV series and movies being released on a seemingly weekly basis which regurgitate old stories in to various different but not necessarily new contexts. However, before you shrug your shoulders in agreement and go elsewhere, give Little Red a chance. This is now Hollywood backed blockbuster with cynical intentions towards your wallet or purse. Little Red has been created by a new animation partnership from Upstart Films, Silsoe Mouse. This team comprises Ben Turner who directs and Pascal Bideau who composes the music. Together they have created this visual feast which takes a slightly different approach to the legend of Little Red Riding Hood. Hang on till the end where Bideau’s talents truly come to the fore with some music that will stay in your head longer than you probably want it to! The James Webb Space Telescope is due to be launched in 2015 and before that happens there is a lot to do. This awesome photograph shows the sheer scale of the project. It shows the 18 primary mirror segments which will ultimately work together as one large 21.3-foot (6.5-meter) primary mirror. They are made from beryllium which is extremely stable at cryogenic levels of temperature. Yet as it is not very reflective each of these mirrors is coated with gold. 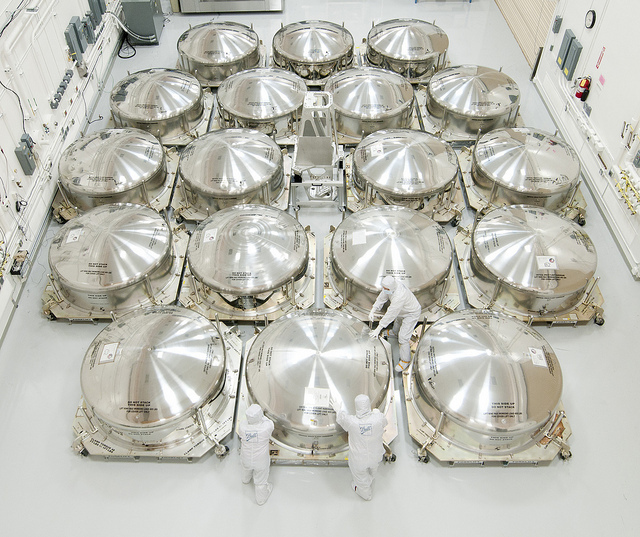 Here you can see the mirrors, made by Ball Aerospace and Technologies Corp in Boulder, Colorado, packing the mirrors in to special carriers for delivery to NASA. The Webb telescope is the world's next-generation space observatory and descendant of the Hubble Space Telescope. The most potent space telescope ever constructed, the Webb telescope will deliver images of the first galaxies ever created, and discover planets around far away stars. I suspect that this short was made on a budget approaching zero but it still doesn’t detract from the fact that for me it is one of the more satisfying science fiction shorts that I have seen over the last year. 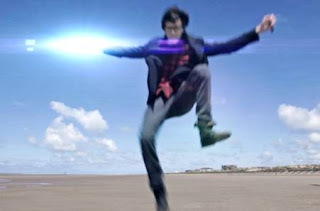 A young, rather nerdy man discovers a device which instantly transports him to various places. As it dawns on him how the device works he begins to make plans to visit all those places he has never been able to get to before. Yet. Oh yes, there’s always a yet with this kind of story. The Device has a very satisfactory twist in its tale. Directed by Claude Lee Sadik a freelance cinematographer and featuring Leo Mates as the traveler, The Device is perhaps at least partly inspired by Sadik’s own life. He is a Franco-Brazilian born in Belgium who moved to Africa where he lived for 7 years (4 years in Cameroon and 3 years in Rwanda). 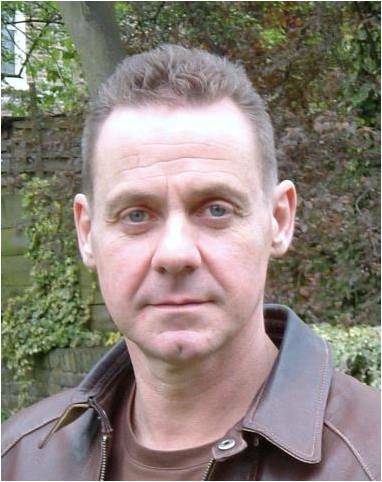 Since then he moved back to Belgium, then to France and is now based in Manchester in the UK. 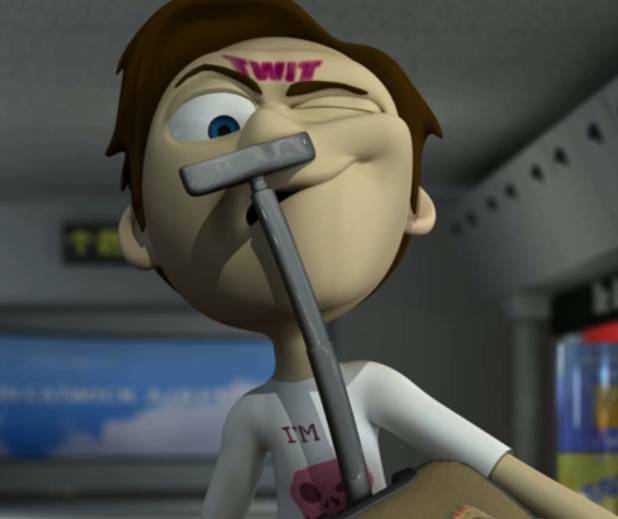 He must have wished for a similar device during some of his travels! What I particularly like about The Device is how it just gets on with the story and at under four minutes you don't feel that your time has been spent listening to techno jargon about how the device might work and whence it comes. Sadik lets you draw your own conclusions tells the story effectively in real time. This is a collaboration between FIRMA, one of the one of the leading commercial design teams in Russia and Dmitry Malikov, the Russian composer, and singer whose recent successes include Pianomania, a mixture of Russian classical music and ethnic culture in a modern adaptation including instrumental music, dance shows and colorful performances. This combines his piano works with contemporary dance. You also get to see Malikov riding by on a bike here (with it has to be said a rather quizzical look on his face) as a team of dancers interpret his music. Your own interpretation is, of course, up to you. I love the movements of the dancers here – the juxtaposition between the men and the women. It could represent how the world might turn if there were only women or, naturally the flip side – only men. Or perhaps not – see for yourself and decide! Either way, it's very, very cool. The best sort of inspiration can often come from children. Animator and illustrator Will Rose witnessed his niece’s excitement at the sight of a goat herder and his flock in Spain. Such was the impression the caprine collective made on her that she chanted lots and lots and lots of goats! As she was two at the time you can imagine just how long it lasted. While the child recited, Will snuck off and created this animated short for her (and now for our) entertainment. It tells a simple tale of a goat herder and, you’ve guessed it – lots and lots and lots of goats. Plenty of things happen on their journey but nothing that adds up to anything which will change the world – and that’s where the great pleasure in this short lies. These pictures could easily be publicity stills from a new science fiction blockbuster set on an ice bound planet circling a distant sun. 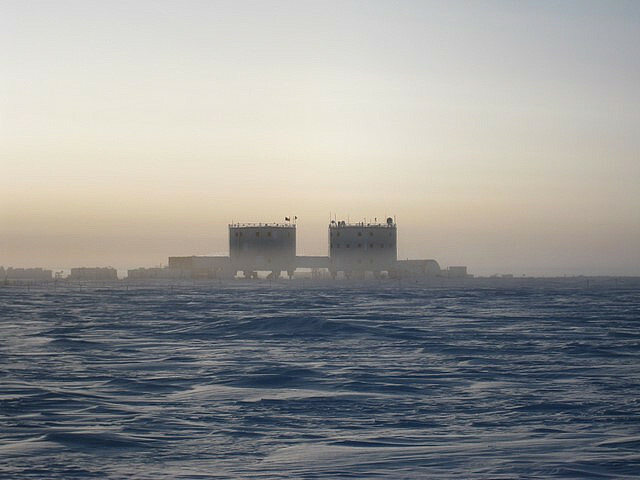 It is, however, the Concordia Research Station which is located on the Antarctic Plateau in Antartcica – the largest desert in the world. It is one of only three research stations on the plateau to operate permanently on a year round basis. Inspiration comes in many forms and I would not necessarily have thought that a charming animated short could have been inspired by the works of contemporary Polish sculptor and collaborative artist Paweł Althamer despite the wonderful nature of his work. Yet that is what Warsaw based Czosnek Studio has done. It tells the story of two flat mates, a cat and a dog. It is a rainy night and the poor weather just adds to the cats feeling of listlessness and boredom. So, the dog concedes that it is about time that they took one of their trips together – and so they head, literally, to the other side. The pair certainly do not end up quite where you might expect. It’s pretty zany stuff but was created (and funded by the Zachęta National Gallery, one of Poland's most notable institutions for contemporary art) and kids will love it for the characters as well as their adventure. It also serves, perhaps, as an introduction for the young to the effect of complex non-verbal communication performed by artists in interaction with each other; this, after all, is at the heart of Althamer’s artistic philosophy. It is done to great effect here and is a great example of how animation can work simultaneously on so many different levels. If you were asked when the mobile was invented you might probably think I was asking about the telephones. However, in 1931 Marcel Duchamp suggested a word that could be used to describe Alexander Calder’s kinetic sculptures – and that word was mobile. 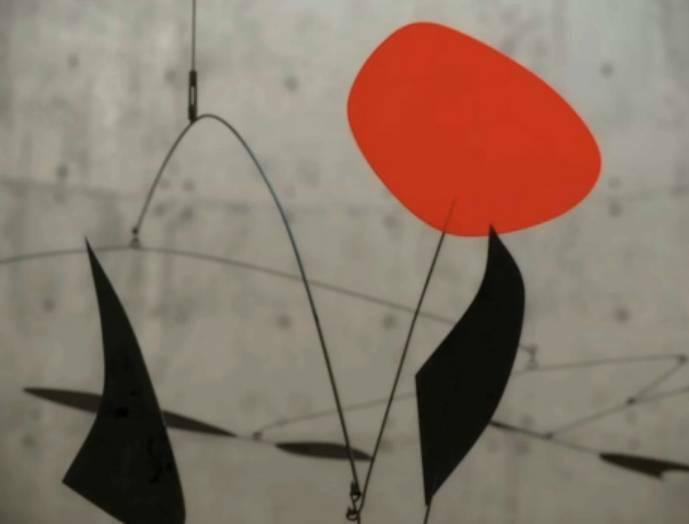 Since then the word has come to describe many things but Calder’s delicately balanced or suspended components which move in response to motor power or air currents were to become his trademark, much more so than his static, stationary sculptures which he referred to as stabiles. Animator Sergio Godoy was inspired by Calder after attending his exhibition at Bilbao’s Guggenheim museum back in 2003. There, he discovered that architecture could meet moving sculpture in a very special way. This animation generated purely using 3D CGI tools and it is Godoy’s homage to one of the vanguards of twentieth century modern art. I found it quite mesmerizing. When you are a little girl and your best friend is a monster then you will soon make finding it a home a priority. What you need is a box – or put properly, a monsterbox. So, this particular little girl visits a shop where she finds exactly what she wants. However, she has more than one monstrous friend! 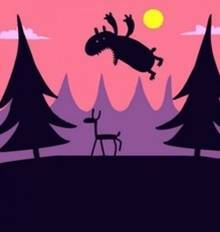 This charming animated short was created by a group of students at Bellecour Ecoles d'Art in Lyons, France. Created as part of their Bachelor degree program the team consist of Ludovic Gavillet, Derya Kocaurlu, Lucas Hudson and Colin Jean-Saunier. This is every bit as good as something you would expect to get from a professional studio, so a huge well done to the students involved! We had always suspected it and now this newly released photograph from NASA reveals that even back in 1964 there was a connection between US astronauts and the order of warrior monks who serve as the guardians of peace and justice in the galaxy. Wishful thinking aside this picture features astronauts (left to right) Frank Borman, Neil Armstrong, John Young and Deke Slayton during their desert survival training. This isn’t Tatooine, after all but the desert outside or Reno in Nevada. 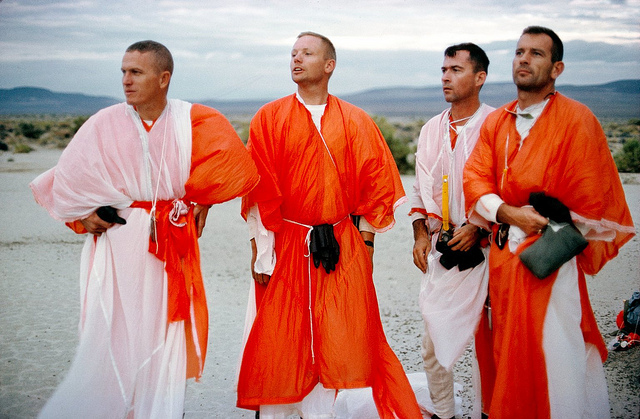 The robes are made from parachutes, the silk of which would keep the astronauts cool in the day and warm in the evening. So, they may not be about to confront the emperor and liberate the galaxy but for me these guys are just as good as a Jedi any day of the week. We have featured a number of animations by Martin Woutisseth on Kuriositas so when he released his new illustrated exploration of Breaking Bad we knew it had to go up on the site. We are used to filmographies but this takes Martin in a new direction. 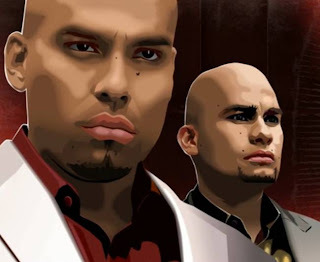 He began this particular animation with making a tribute to Walter White but things quickly progressed until he had thirteen characters including two of my own favourites, the hitmen known as The Cousins. 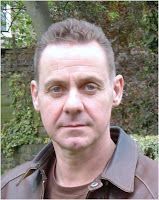 I particularly like the soundtrack that Martin has used here - Mexico by the band Gringo. Thelyrics match up very well with the characters from the TV series. Take a look and see what you think. This will do nothing to convince you otherwise if you are currently of the opinion that quite a few Japanese are, to put it bluntly, a little barmy. Artist Eric Siu has always been a little jealous of the life of a camera so he decided to make himself in to a human version. 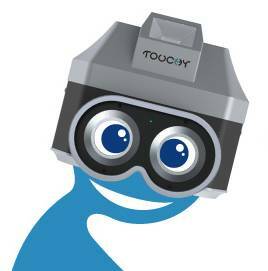 Touchy was born – and for him to work you need to do just that – touch him! Grab the bulb and touch Touchy and his shutters will open and he will be able to see. Touch Touchy for 10 seconds, he will take a photo. This is a short documentary of Touchy's debut street performance in Akihabara - the famous electric town in Japan. Touchy has played with the friendly crowd and took a lot of photos capturing the touchy moments. We are promised that he will visit more places and interact with more people in the near future… only in Japan, eh! It reminds me of something my grandmother used to say on a regular basis when she saw anything that mildly perplexed her - no wonder kids are daft. A snail invents the wheel and goes through a cultural evolution to finally get back to its origin. 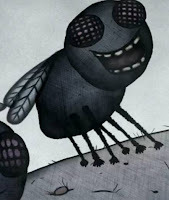 This enigmatic animated short is by German artist Philipp Artus. His experimental animations and site-specific installations explore the manifestations of life through movement, sound and imagery. He composes audiovisual experiences that unite playful elements with minimalist structures, timeless themes with contemporary observations, turbulent acceleration with contemplative silence. Artus describes the project thus: The basic idea of the work is inspired by processes of exponential acceleration, which can be observed at different levels. Thus, the evolution of life proceeds at an extremely slow pace for more than 3 billion years, until it suddenly seems to explode in the Cambrian period. The tools of human beings progress relatively little during the Stone Age until there comes a rapid cultural development during the Holocene. Nowadays, a similar acceleration process is generated by the exchange of information through the internet. From this perspective, the exponential spiral on a snail shell may almost appear like a miraculous wink of nature. Is there a fire on this mountain? Or is it some kind of volcanic eruption? The answer is neither. To paraphrase Dave Bowman from 2001: A Space Odyssey - something wonderful is about to happen. 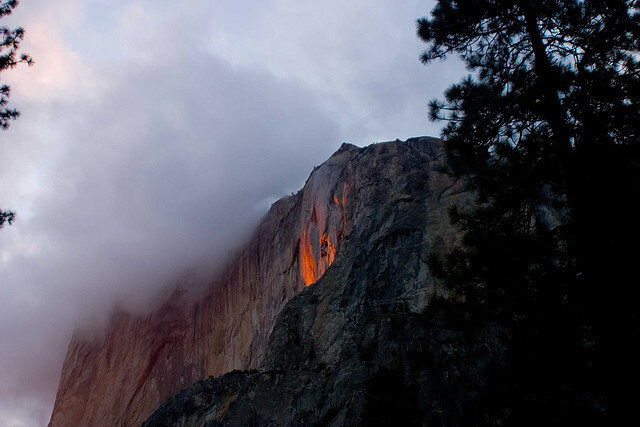 For a few days every February, Horsetail Fall comes to life. A seasonal waterfall which flows only in the late winter and early spring, those short February days bring about a transformation. 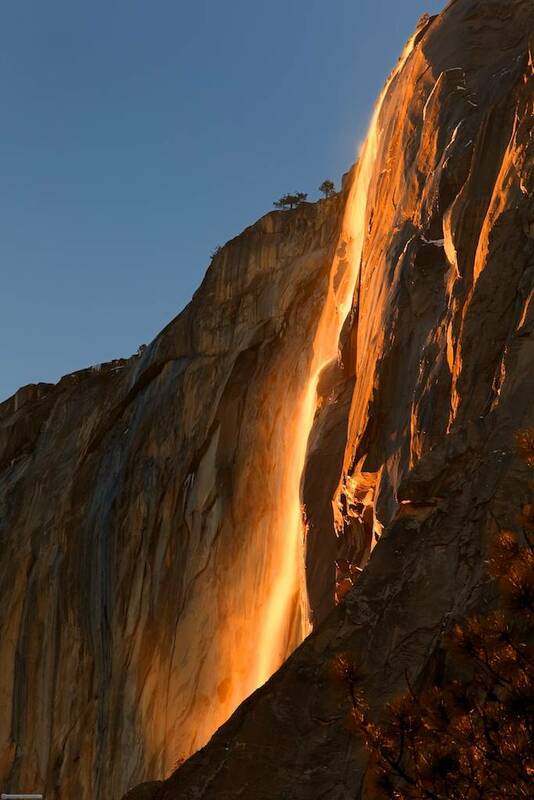 The waterfall is lit up by the setting sun and ignites in to a fiery spectacle. 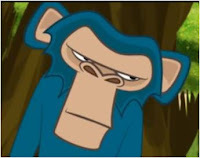 Jungle Brawl by Lee Daniels, which premiered on Kuriositas, is in the running for the NexTV competition finals - which is a large animation competition judged by the largest names in the industry - Disney, NBC, Fox, Sony etc. We're showing it again to (hopefully) encourage you to vote for Jungle Brawl and Lee! If Jungle Brawl wins then Lee's name and details will be forwarded on to all the big names in the industry - which is quite a break! Please take time out if you can to vote for it by clicking HERE or by clicking on the picture and look for Lee Daniels! Thanks folks! Every now and again an animated character comes along that immediately imprints upon the unsuspecting public – and I think that may be the case with Jelly Jeff. 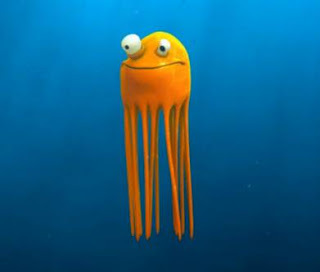 He’s cute, he’s orange and he’s a jellyfish. He is also, poor fellow, completely hapless and is consistently overcome by a series of events most of which have been caused directly or indirectly by us. As such we not only get a chuckle but some important environmental messages too. 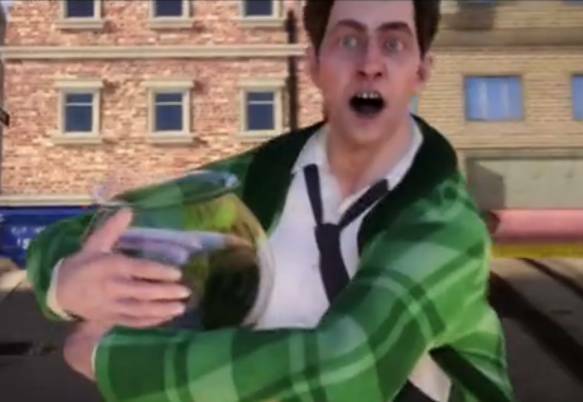 This series of vignettes featuring Jelly Jeff were created by Jacob Frey who created them for the International Trickfilm Festival Stuttgart as part of his degree work at Filmakademie in the same city, one of the most prestigious schools of film and media in Germany which also enjoys an excellent reputation internationally. Instead of doing a single sixty second trailer he opted to do a number of short twenty second slots. So sit back and enjoy the adventures of Jelly Jeff. This should really be made in to a TV show...! 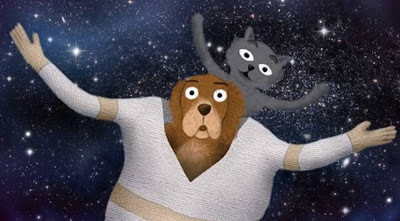 So, over to this animated short by Qais Sarhan who asks the question doesn't everyone like cats? and then proceeds to answer it. Well, perhaps answer is too strong a word. Stir things up a little might be the right expression to use but when there’s a little mischief to be spread I am always happy to oblige in its dissemination. Enjoy! 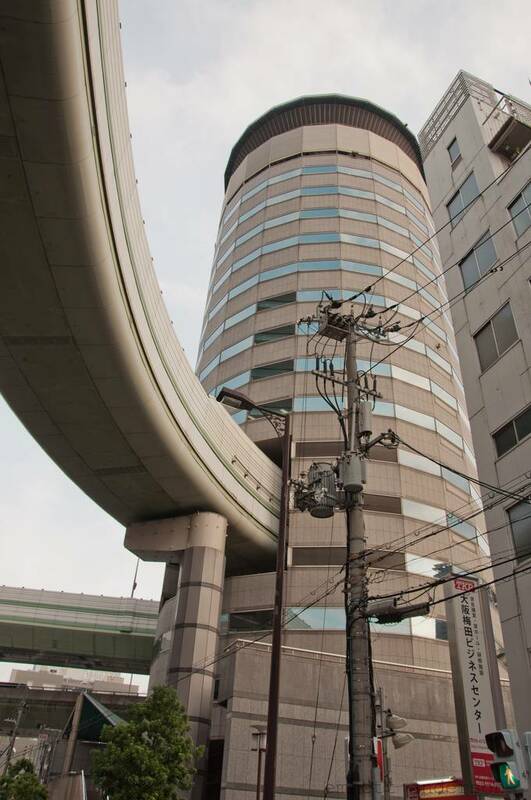 Or should that be the building that has a highway going through it? 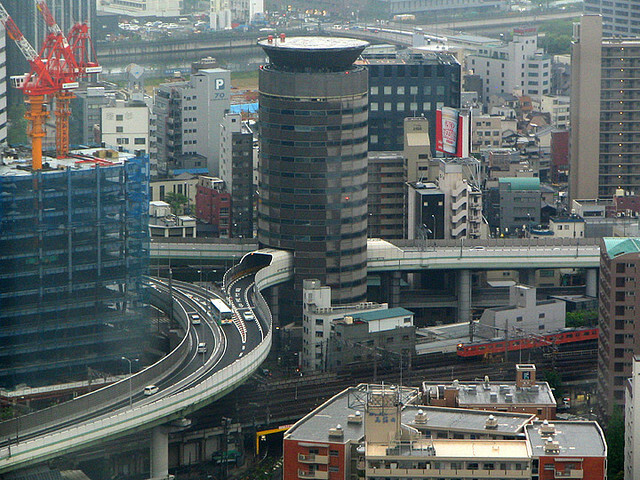 Whichever way you look at it, the Umeda Exit of the Ikeda Route of the Hanshin Expressway system in the Japanese city of Osaka is a head turner. The name of the highway we have already had – the name of the office block is the slightly less exhausting Gate Tower Building. Believe it or not, the area of Osaka in which it is situated, Fukushima-ku, is mostly residential. Yet in the middle of this suburban area you have a somewhat intimately connected highway and 16-story office building. Dredd was released to some fanfare last week and so I thought that I would add my own particular trumpet to the cacophony. I have been a fan of Soulful Creative for some time being in equal parts appreciative and jealous of their immense talent. They have over twenty five years’ experience of creating world class street art behind them so when I discovered Soulful Creative artists Koze and Onion had been hard at work on a Dredd homage on the side of a warehouse near Heathrow Airport in London I did a little investigation and came across this video which tracks its creation. 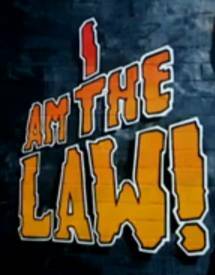 In case you are scratching your head (in which case, welcome to Earth, I am the leader) both the movie and the mural are based on the 2000 AD comic strip Judge Dredd and its eponymous character with Karl Urban in the lead as Judge Dredd. He is a law enforcer given the authority of judge, jury and executioner in the immense dystopian megalopolis of Mega-City One (so it’s the biggest, right?) that lies within a post-apocalyptic wasteland. So, Heathrow being the appropriate place, the chaps from Soulful Creative set about making this very cool graffiti art tribute thingy mural. It isn’t often that you can upstage a theater full of movie stars but that is pretty much what Canadian troupe Cirque de Soleil did at the 2012 Academy Award ceremony. 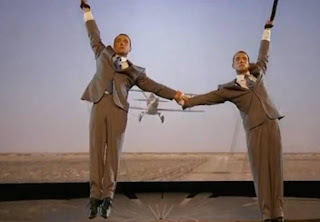 They provided the assembled great and good of Hollywood with a movie-themed dance and acrobatic performance which left the audience slack-jawed and standing in appreciation. I didn’t watch the Oscars this year (I was asleep on the other side of the Atlantic Ocean) and so was really pleased to come across this. It is sheer genius (and whether or not you usually like this sort of thing you have to hand it to them for their sheer bravado and joie de vivre). If you are a fan of Chaos Theory then you will no doubt be familiar with The Butterfly Effect. Essentially, a small change at one place in a deterministic nonlinear system can result in large differences to a later state. Or, as this hapless man discovers, the lack of milk in his fridge will lead to a series of events he could not possibly have foreseen. Although the effect is not thought to kick in so quickly, this gives you the idea. The Butterfly Effect was created by Passion Pictures and directed by Dan Sumich. 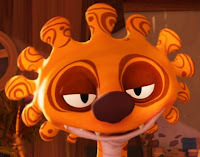 It is one of Europe's leading independent production companies, producing award winning films in a variety of contemporary styles including 2D drawn animation, computer animation, stop frame animation, mixed media, and live-action. 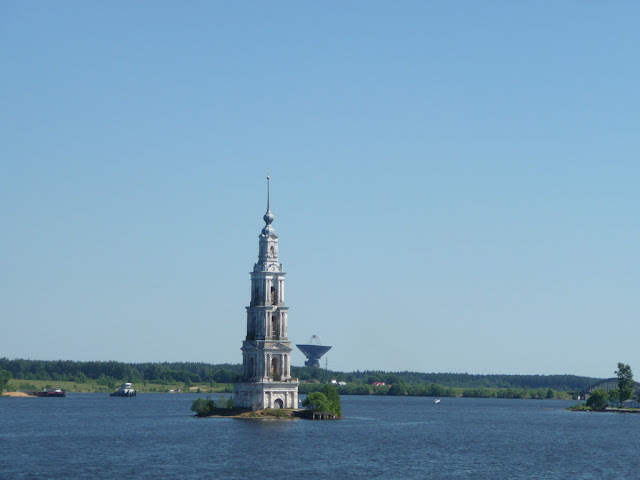 Take a trip up the Volga river in Russia and when you get to the small town of Kalyazin keep your eyes peeled for something unusual. There, in the middle of an artificial lake stands something a little perplexing. Is it a weird Russian form of lighthouse? Some weird folly built on an island? The answer is a resounding no. During the 1940s the then Communist government had big plans to make the turbulent river navigable all year around. So a cascade of dams and reservoirs was ordered on the Upper Volga. It gave the region the much needed transport artery and hydroelectricity in to the bargain. 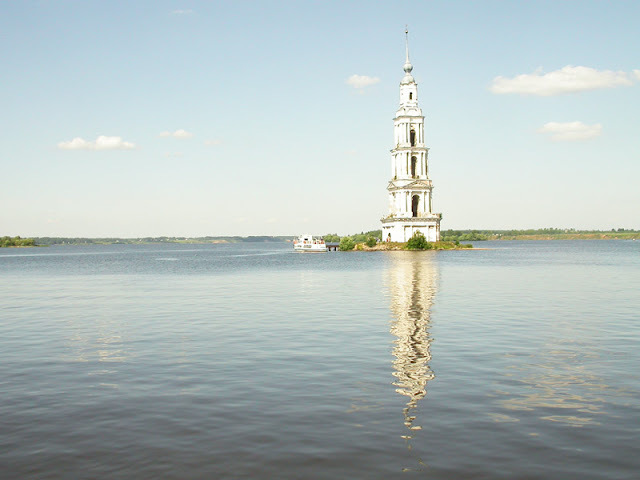 It also buried hundreds of years of history, of which the bell tower of the Makaryevsky Monastery is the only visible remnant above the waters of the Uglich reservoir. You have to watch this one right to the end to get it - and then it asks more questions than it answers. This is the circle of life, macro style. A host of small insects chomp, devour, masticate, crunch, chomp and champ their way through life. The aim of each is to live just a while longer, to prolong their genetic code to the next generation. As they gulp and gobble there is a larger presence but you have to be patient. 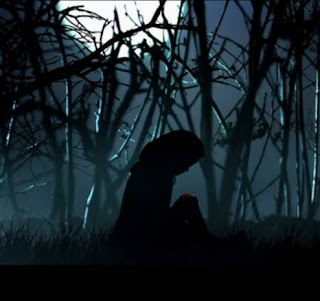 The name of this animated short refers to the covenant love of God for humans, as well as the human reciprocal love for God. 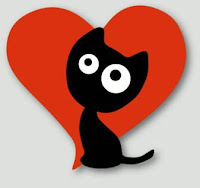 Yet is this love symbiotic, parasitic or simply lethal? You get to answer the question yourself. 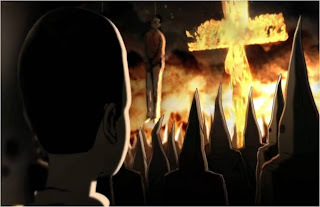 This animated short by Alexandre Iliach with (rather hypnotic) music by Marnie Lee MacLeod has certainly, if you forgive the pun, given me food for thought. It does go to show, too, that animation does not need to always be simplistic in its message. I wonder what Nietzsche would make of this. We’ve been waiting a while for this and it doesn’t disappoint. 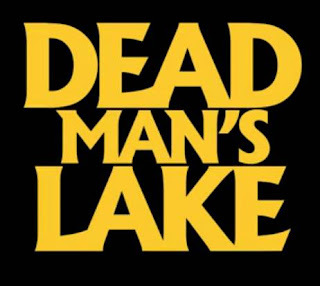 The sixth installment of the Bloody Cuts series of the gruesome and ghastly, Dead Man’s Lake is a homage to all of those slasher movies of the 1980s. Yet as with the preceding five short movies in this series, everything is not all quite as it seems and the genre gets somewhat subverted. This short starts with a classic B-movie horror scenario – three friends go camping in the woods. We have the usual suspects, the jock with a heart, the pretty girl with the long blond hair and the libido and the nerdy kid with (probably) a troubled background. Together they blithely ignore the warnings that tell them to keep out and head to the lake for a summer night’s camping. Of course, it’s not long before things start to go wrong – but despite your best efforts to make them listen by shouting at them to do exactly the opposite, these kids just carry on regardless. The story is drawn from the brain of Bloody Cuts creator Ben Franklin, who takes directing duties for the first time. The script is Joel Morgan. Although you may think that the warnings at the beginning are part of the pastiche – beware! If you are faint hearted (as I am) you will end up watching this from between your fingers. 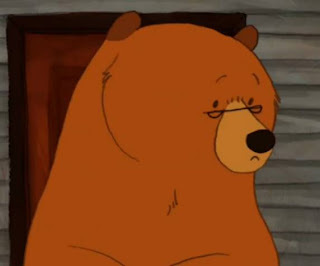 If I was to ask you what bears do in woods I am fairly sure that the answer you are most likely to respond with is not something I can repeat here. However, this is a twist on that particular old tale. This old bear is looking forward to his retirement in the woods. He finds a lovely cabin and begins to settle in. Perhaps he has too much time on his paws, perhaps he has some sort of ursine compulsion but when a leaf strays in to his immaculate garden it starts an urge which he cannot overcome until it is taken to its unnatural conclusion. Perhaps Thoreau should have expanded his statement that all men lead lives of quiet desperation to include the male of most species - or at least this poor old bespectacled bear. Who can say but one thing is for sure. This is a marvellous and gently funny piece of work, created by Helen Dallat in 2011 (from a story by Daisy Gould) as her graduation film from University of Wales, Newport. 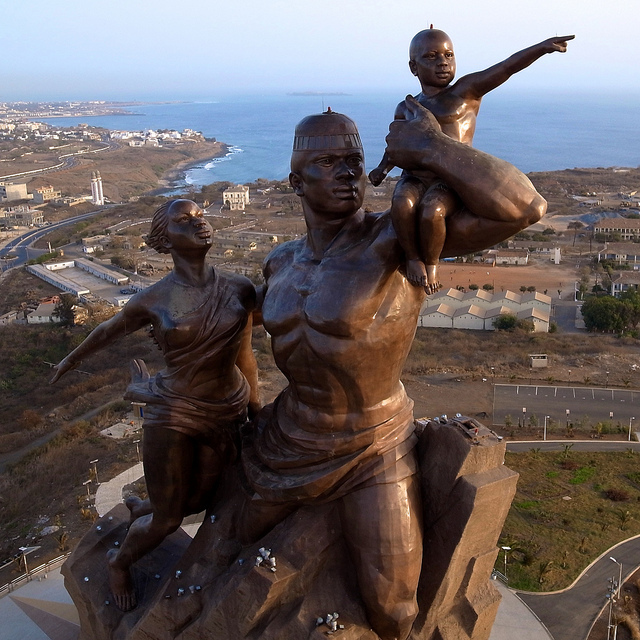 The Monument to African Renaissance – Magnificent Symbol or Colossal Folly? 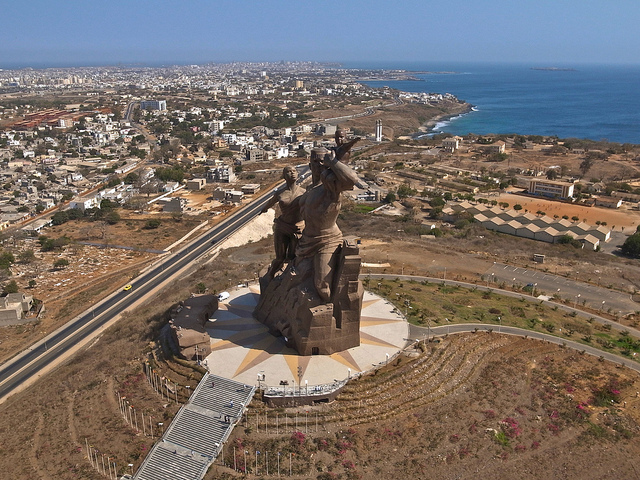 At one hundred and fifty meters in height the Monument to African Renaissance dominates the skyline of the Senegalese capital of Dakar. 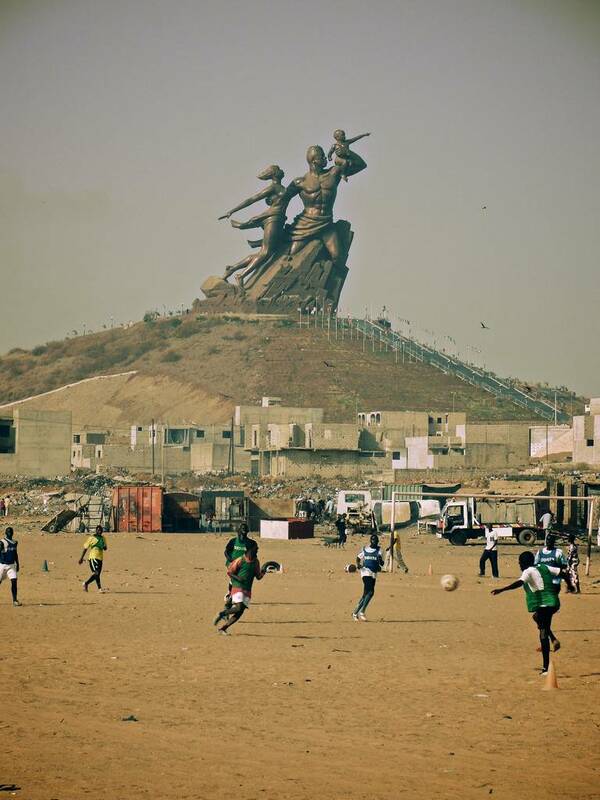 Its scale is quite breath-taking: new monuments of this size are rare and this is the largest statue in Africa. Yet although it was billed as a celebration of the continent’s renaissance it has become something of a scandal in the economically distressed African republic. Unveiled in 2010, it may be a couple of lifetimes before this symbol of a desired renaissance is rehabilitated. Shyness is often compared, metaphorically, to an animal. Yet a crocodile? When you watch this you will think why not? 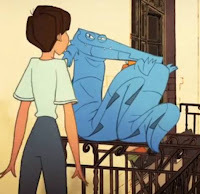 This very smart animated short tells the story of a young woman, whose timidity is represented by the aforementioned large aquatic reptile. Every step she takes, he follows. Everything she does - he always seems to get in-between. Even though he makes her life a misery you have to admit – for a croc, he’s kinda cute. The animation was created by Alice Bissonet, Aloyse Desoubries Binet, Sandrine Han Jin Kuang, Juliette Laurent and Sophie Markatatos as part of their studies at Gobelins in Paris. 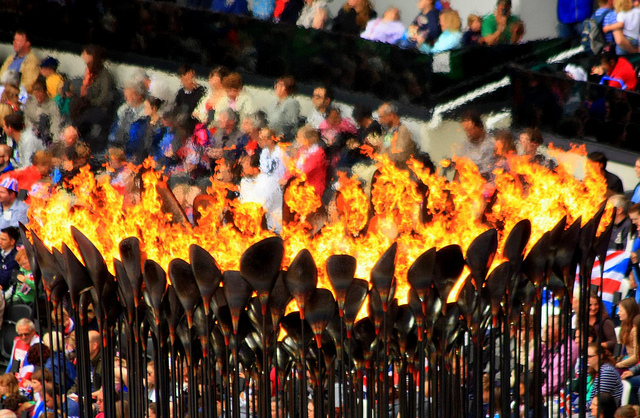 As the UK closes the curtains on the Olympic world stage and marks the end of the 2012 Paralympics, guest writer Danny West (left), trainer, coach, mentor and leadership consultant, reflects on the last two weeks and how everyone can join in to sustain the game's legacy. 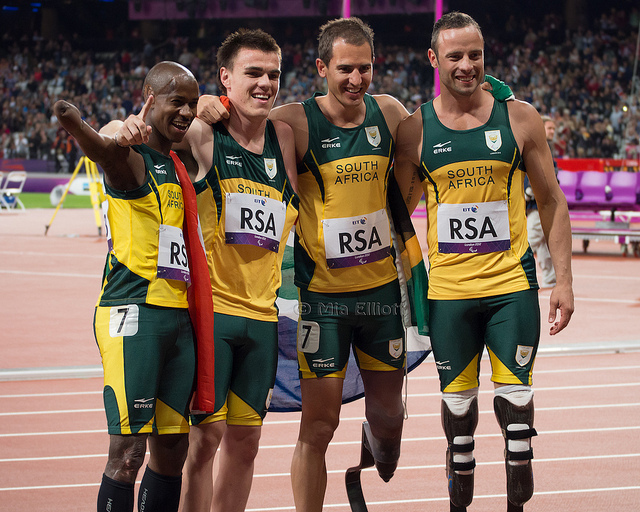 The world has just witnessed a unique demonstration of disabled people’s absolute ability to overcome adversity, achieve world records and participate as fully able and highly skilled equal members of society. The UK is proud to be positioned in third place in the Olympic medal tables; the world’s Paralympians have demonstrated that they have a remarkable ability to achieve their goals and have impressed and inspired the world with their skills, dignity and determination. The human spirit which has been utilised to confront and overcome a multitude of physical, emotional, psychological and environmental barriers has achieved the seemingly impossible and has potentially changed the views of non-disabled people, institutions and governments throughout the world. This struck something of a chord with me and I suspect it may with quite a number of you too. Have you a piece of luggage, perhaps a suitcase (trolleyed or otherwise) which, despite its age and general decrepitude you just cannot part with? Filminute an International one-minute film festival launches in to its 7th edition this week. There are some very exciting finalists this year. Altogether there are 25 one-minute short films and animations competing for the title with 15 countries represented. The shortlisted films are subject to both a public vote and a review by an international jury - luminaries from the film, arts, literature, and advertising fields. Here at Kuriositas, we can’t help but join in – so here are our 5 favorites from this year’s line-up. You can follow the link on each title to vote for the one you like best. You can also go to the website to see the others, all of which are outstanding 60 second short films. Some items of film direction are very difficult to explain. Unless of course, you have a visually stunning teaching device such as this from kogonada. In one-point perspective a single vanishing point is typically used for roads, railway tracks, hallways, or buildings (interior or exterior)viewed so that the front is directly facing the viewer. 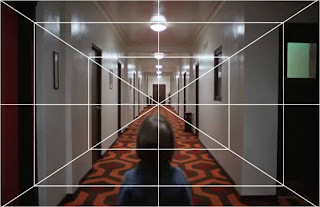 Any objects that are made up of lines either directly parallel with the viewer's line of sight or directly perpendicular can be represented with one-point perspective. Without using any of these words (or any at all for that matter) this marvelous piece of film explains it all. More than many directors, Kubrick was aware of the emotional and mental effect it has on audiences – it can be somewhat disquieting on film. This reel is a prime example of how disconcerting evenness and proportion can be in motion picture photography. Even when there is no clear and present danger there is something in the balance which unbalances the viewer. They produce a feeling of unease. Everything appears correctly in place but there is something out of kilter in our minds. This is a wonderful example of how one auteur used it throughout his oeuvre to incredible effect. You will also, hopefully, have great fun movie spotting in this short (it is less than two minutes in length). James Brown is a force of nature, a gift from heaven. He invented funk, but it was a symbol of freedom and success for millions of black American in combat for their civic and civil rights, who saw him as a source of hope and pride. Xavier Fauthoux, the director, here visually describes the richness of his life and its times. This animation was created for this year’s Music Video Challenge. The 2012 Challenge was in celebration of the James Brown catalogue being re-released on iTunes in May, and the re-issuing of the classic James Brown Live at the Apollo album later this year. 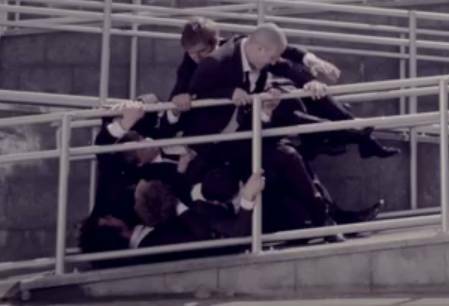 This is the director's cut version of the video music of James Brown - It's Man's Man's Man's World. 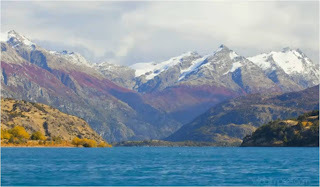 Patagonia is a region situated at the southern end of South America, with territory belonging to both Argentina and Chile. This superb short film shows the lesser known Chilean part of Patagonia and once you finish watching it you will be scratching your head as to why – the landscapes are simply stunning. The main locations used here were the Torres del Paine National Park, the Cerro Castillo National Park, Tamango Reserve, Queulat National Park and Chacabuco valley among others. The film was created by Raúl Tomás Granizo, who was raised in Spain but fell in love with Patagonia – and you can see why. He is the founder of wildglimpses, and is a freelance wildlife filmmaker and nature photographer always looking for the essence of nature. We think he has captured it supremely here! This is quite a remarkable piece of animation by four students from Supinfocum, Alexandre Charleux, Amaury Brunet, Ning Zhang and Victoria Bruneel. 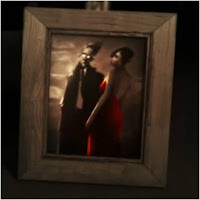 It combines their love and respect for the film noir genre and takes inspiration, too, from the graphic novels produced by their peers at university.